The ideal plant for the beginner gardener. If the soil is prepared well with lots of compost, runner beans are very forgiving vegetables. The foliage is attractive, and the red or white flowers making this a beautiful garden feature. Originally a perennial plant from South America, they are grown in the UK as a half-hardy annual, being struck down each year by the frost. They produce large amounts of beans and juicy flesh which are best eaten soon after picking, but also freeze well. Many varieties grow to about 2m (6ft) tall and therefore need support. Some of the more recent varieties are dwarfs and need no support making them particularly easy to grow. Runner beans prefer a position in full sun, although they tolerate part shade very well. Because of their height, they should not be grown in areas exposed to winds, they will easily be blown over. Remember also that their foliage is very thick and this results in them casting deep shade over a wide area. Useful for some vegetables but not so good for others. Part of the 'legume' family of vegetables, runner beans are able to extract nitrogen from the air and fix it in little nodules on its roots. For this reason, the soil should not be rich in nitrogen, which would only result in lots of leafy growth and few beans. The ideal soil is deeply dug with lots of well-rotted organic matter (peat or peat substitute is ideal) incorporated. This will ensure that the soil is capable of holding lots of water, a key need of runner beans. Prepare the soil in February or March. 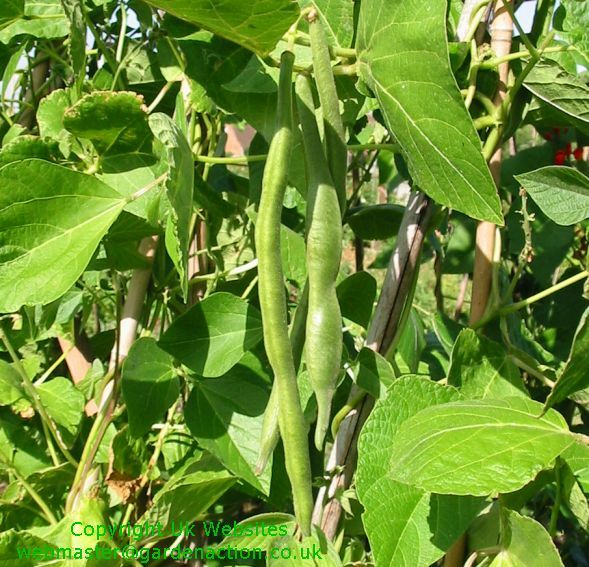 If unprotected, Runner Beans are in almost all cases damaged by any degree of frost. Where the seedlings have appeared above the soil surface and a late unexpected frost strikes, it is best to remove them and plant more seeds in their place. The best time to plant Runner Beans outside is a week before the last frost (click here for frost dates in your area). Cloches or supported plastic will protect them if a late frost is predicted, as will plastic bottles with the bottom cut off placed over the seedlings. The other alternative is to sow the seeds in peat pots and initially grow them on the windowsill until all danger of frost has passed and then plant them, peat pots and all, directly into the ground. Remember to soak the peat pots in water prior to planting so that they will quickly break down in the soil. Message: Whitefly are a nuisance. They leave a sugary substance (honeydew)on the leaves, just the right substance for sooty mould to feed upon. Spray with neem oil. Read the text on these pages for bean fertiliser advice. Message: I am growing runner beans in East Africa, Kenya to be specific. There is significant white fly infestation, that eventually manifest into a black sooty appearance on the beans. I am looking at an acceptable chemical control. Grown and black and red volcanic soils, what are the best fertiliser recommendations for maximum yields. Message: I have lost my rted runner bean blossom to sparrows this year. i don't want to net them in case the get cuaght. Would white blossom be better? If so, What variety would be prolific. Message: I put a couple of layes to kitchen towel in an ice cream tub, damp it and then lay 15 beans on it. When the beans sprout, I sow them as described. The first ones I sow, in my greenhouse, (on a window ledge if no greenhouse) using the inner tubes of toilet rolls. I pack compost in, and firm it so that the tube is half full, sow the bean, and then top up with compost. I then put them in an ice cream tub (Walls) which will take 12 tubes. I plant them out when there is no danger of frosts, and the plants are about 6 inches tall. Using the inner tubes means that there is no root disturbance. I then follow the same process for successive sowings - I usually sow three or four lots at intervals to make sure that I have a long season. When they are climbing up the canes, I pinch them out, just above a leaf, when they are about 3 feet tall, so that they bush out and pinch out again when they reach the top of the canes. This year I have grown St George, a new variety that had a good review from Wisley, and my favourite, White Achievement, which has never let me down. In answer to David in Maryland. I would suggest watering with a tomato fertiliser. It would appear that your soil is high in nitrogen, which produces growth and leaf. Jane Spindler. White flowers are fine. Some runner beans (Painted Lady) produce a two-coloured flower, as does St George, the bean that I grew this year. White Achievement also has a white flower, and the seeds are also white, not mottled like most runner bean seeds. Message: My beans are doing great - plenty of flowers and small beans developing. I have pinched out the growing tips at the top of the canes and this has caused the plants to produce new side shoots beside many of the flowering stems. Should I nip these out to send most goodness to the main flowers or leave them to produce more runners/flowers? Message: I planted runner beans. We have had no frost, I dug a trench and filled it with compost. I water every day or two. The plants grew quickly to about 6 foot high, they have many beautiful red flowers - but no beans. NONE of the flowers have produced a bean! There are plenty of bees, good soil with lots of compost, water. I have ben gardening for 60 years. I bought the seeds in the UK this year. I am growing them in Maryland, USA. Any ideas anyone? Message: hi my runner beans look weak, leafs yellow and dying.getting a few flowers.my first year of growing.they are about 8 weeks old.cheers mark. Message: This is my first year for growing runner beans they have started to flower, but the flowers are white not red is this ok. Message: My beans have rushed up their 6ft canes and now have nowhere to go. Should I cut them off (would this encourage them to get bushier?) or just leave them to flail about? Message: Few bees about this year and flowers are dropping off unpolinated. Also for the first time ever I've noticed small patches of a mould/fungus on the underside of the leaves. I'll try Des'sugar water spray. A pal of mine sprayed his with some home made wine which he didn't like. Killed the lot. Message: I would be appreciative if you could send me ideas/details of ideal support frames. Message: plenty of growth but not many beans when should they be harvested? Message: I have a bumper crop of runner beans in a shady spot of the garden in a greenhouse with just 2 plants. My greenhouse is a polcarbonate one with removaable roof panels. I've removed one of the roof panels, allowed the beans to grow up over the top of the roof panels and just sit on the others for support - amazing results and the bees are busy polinating! A brilliant way to protect from early frosts and ensure a bumper crop! (only remove the roof panel when plants are safe from frost). Message: Most peoples beans do not seem to have done terribly well at the start of the season but an old gardener friend of mine said that his missus used to spray her flowers on the beans with sugar water. It seemed to have worked on mine cos I am now picking beans daily virtually by the pound. Something to do with the dry weather at the start of the growing year and the lack of bees. I do not think that a greenhouse would be of any help in fact it might stop pollination cos the bees couldnt get at the flowers. Message: My vegetable plot is in part shade, but this is the only spot available for it. My runner beans did not do terribly well this year (the first year of trying growing veg) and I suspect the shade is the reason. I am toying with the idea of putting a plastic (or even glass) greenhouse in the same spot and growing the beans in the greenhouse. I thought the glass might make the most of the sun that is available. Do you think that is worth trying or should I just restrict myself to vegetables which don't need full sun?